Do you ever wish that you could read something that was uplifting but not overly dramatic with Bible messages or self-help preaching? If yes, then I may have a suggestion for you. I recently was given, for free, Ed Douglas' book 25 Truths: Life Principles of the Happiest and Most Successful Among Us, published by Ed Douglas Productions, in exchange for an honest review on this blog. Book is small enough to slip into your purse or backpack! I am usually not into these types of books. As I stated above, I often find them saturated with Bible messages and a bit too preachy as to what I am doing wrong in my life. 25 Truths, however, seemed different. It does have Bible references, but they are mostly limited to scripture quotes instead of the author's interpretation of the Bible message. Ed Douglas also uses a lot of real, modern day examples to relate his points. This appealed to me. Nothing is more discouraging when you are looking for guidance than to find out an author has apparently never lived down here on this planet called Earth. Or they are down here but living out a life that is completely unobtainable to you because of limitations in circumstances. I also have a hard time relating to stories that, although meaningful, are really out of date with modern times. At the end of each "Truth" there are discussion questions intended to help you expand on the examples given. Many other readers were sharing this book with their children, but I don't think my children are ready for a book of this maturity, my oldest is only eleven. Remember, there are "real life" examples in this book. Nothing offensive or illegal, but examples about careers and community leaders are not going to appeal to my boys. Nor are examples pertaining to social media when I don't allow them to be on the computer. I guess I could have shared this with my hubby, but I felt like I wanted to have this on hand to read and explore on my own terms. I would pick up the book several times a week and read a section or two. Sections were short, usually three to five pages. I didn't even read them in order. I would scan the Table of Contents for a title that sounded interesting and read that. Sometimes I would read and think about the questions. Sometimes I would skim that questions and think about them later, like on a run or a long drive. Sometimes I would read a section while I was waiting for the kids to finish in the tub, or I would get the book and sit out on the deck to read. It was easy to incorporate this book into my life because you can tailor it to fit your needs at the time when you read it. Although I don't have a lot of experience with these types of books, this book was definitely worth my time and I would recommend it to many of my friends. In fact, at our Fourth of July gathering I did indeed bring up examples from the book, twice! I don't think of this as life-altering or that I am going to be forever changed, but it was nice to see how others are living out their lives as good Christians, and to see that although road isn't always easy, it can be navigated successfully. It definitely gave me pause to think about all the ways I portray myself to others, and if that image is working for me, or against me. 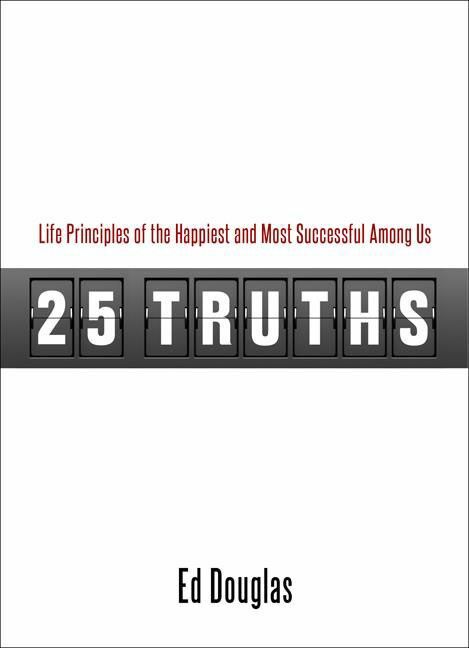 25 Truths: Life Principles of the Happiest and Most Successful Among Us by Ed Douglas is available on the website for $15.50. In addition to this book, Ed Douglas has written other books including one titled: The Money Marathon: 7 Simple Steps to Financial Freedom. All his books can be viewed on the website. Other reviewers on The Schoolhouse Review Crew also got a chance to read this amazing book. Click here to read their reviews or click the banner below.